Allows for a scaffold plank to be placed outside the base of scaffold to get closer to their work. 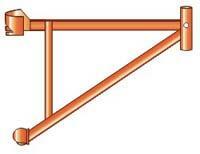 Requires 2 side brackets per 1 7' scaffold planks. * Please call us with any questions about our scaffold side bracket 20 inch ea rentals in Oak Grove MO, Blue Springs MO, Independence MO, Lexington MO, Odessa MO, Independence MO and Western Missouri.